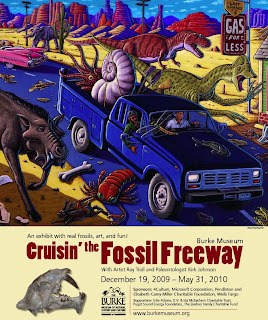 Cruisin’ the Fossil Freeway with Artist Ray Troll and paleontologist Kirk Johnson is a small exhibit on at the Burke Museum (University of Washington) from December 19, 2009 to May 31, 2010. Ray Troll is an artist whose distinctive work you may have seen before. In this exhibit Troll teams up with paleontologist Johnson for a whimsical yet serious look at evolution, extinction, and life on earth. Fossils are displayed side by side with Troll's original artwork depicting the animals represented by the fossils - often in funny situations. The concept of extinction is presented as a natural part of the cycle of life. In fact, over 97% of species that ever lived are now extinct. The average mammalian species lifespan (from origination to extinction) is about 1 million years. Paleontologists estimate that humans have been on the earth for about 200,000 years. Will we beat the average? Knock, Knock, Who’s There? Edward Jones.